This crock pot loaded baked potato soup recipe is comfort food at its best with hunks of potatoes nestled in a thick soup base and covered up with my favorite toppings. ‘Tis the season for all the carby things! 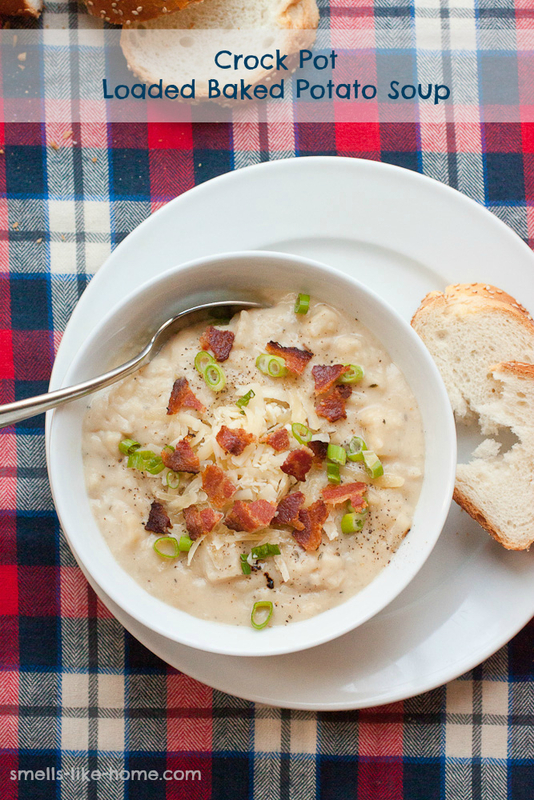 And boy, does this crock pot loaded baked potato soup fit the bill. One of my favorite foods of all time is a heavily loaded baked potato with lots of ground pepper sprinkled on top. In fact, in preparing for my first weekend home from college freshman year, my mom asked me what I was craving. It was steak and a baked potato. Really, it’s the simple things in life, isn’t it? So you can imagine how insanely happy this soup made me as the weather really started changing a couple weeks back, with foggy, cold mornings followed by clear and crisp days that seemed to go on forever. I made this soup on a recent Sunday, not a day I usually pull out the crock pot. But we had planned a pumpkin and mums expedition in the afternoon after Kyle finished up some of his side work (say hello to life of a contractor’s wife), and I knew I wouldn’t want to cook dinner when we returned home. And I was right. Because as we crunched through the leaves in the front yard to oh so strategically place those pumpkins and mums on the front steps, all I could think about was wrapping myself in a blanket on the couch in front of the fire and catching up on the DVR for the rest of the day. 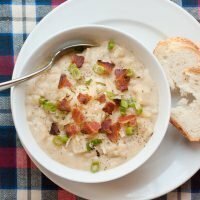 Within a few minutes of heading inside, we dunked the ladle into the crock pot and pulled out this steaming baked potato soup. We loaded it up with Cabot’s finest, crumbled bacon, scallions, and a heavy crank of fresh ground pepper. If I had planned better, sour cream would have been involved too! If I were to go a little healthier with the toppings, I would add some roasted broccoli in place of the bacon. But I’d keep the cheese, of course! 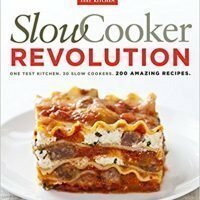 With barely 20 minutes of hands-on work, this soup couldn’t be any easier to make over and over and over again during the cold months that are now upon us. 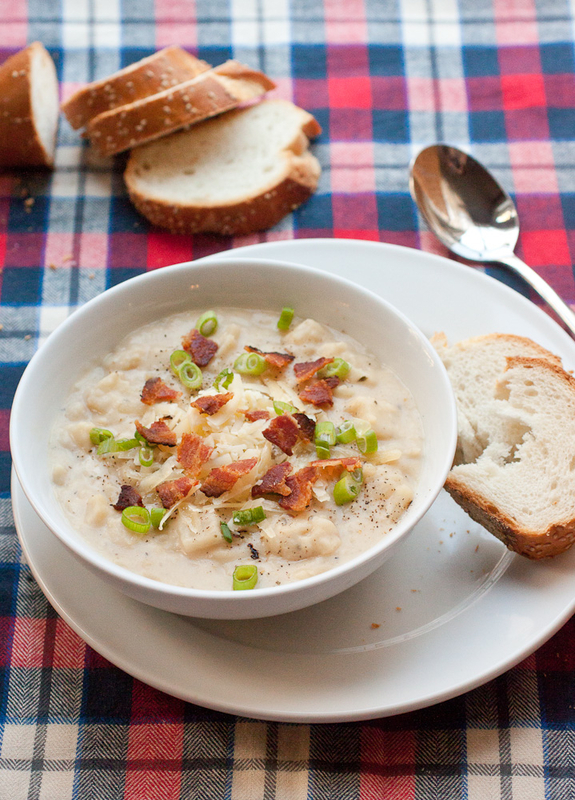 And unlike the best baked potatoes out there, this baked potato soup doesn’t actually include baked potatoes! Dump everything into the crock pot with more broth. And then you’ll let the crock pot do its magic for 4 to 6 hours on low! Serve up the soup with your favorite toppings. This crock pot loaded baked potato soup couldn’t be an easier meal to prep before work for a cozy weeknight meal or on a busy weekend while you shuffle the kids around to activities! 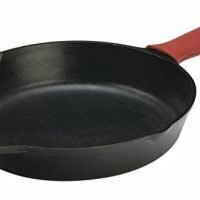 Add the bacon to a 12-inch skillet and cook over medium heat until crisp. Transfer the bacon to a paper towel-lined plate, cool, and refrigerate until serving time. Pour off all but 2 tablespoons of the bacon fat and add the onions, garlic, thyme, and ½ teaspoon salt to the fat. Cook over medium heat until the onions have softened, about 8-10 minutes. Stir in the flour and cook for 1 minute. Slowly whisk in the chicken stock/broth, scraping up any brown bits from the bottom of the pan. Transfer the contents of the pan to a 6-quart crock pot, then stir in the remaining stock/broth and potatoes. Cook on low for 4-6 hours, until the potatoes are fork-tender. Spoon 2 cups of potatoes from the crock pot into a bowl and mash until smooth. Stir the cheese into the soup until melted then stir in the mashed potatoes and heavy cream. Season with salt and pepper to taste. Turn the crock pot to high for 5 minutes to allow the soup to heat through. Serve the soup topped with extra cheese, crumbled bacon, and scallions (or anything else you love your baked potato topped with!). To speed up your day-of prep time, you can dice the potatoes the night before you need them and keep them in bowl or pot of water (both should be covered) at room temperature. The water will prevent the potatoes from turning brown. Drain the potatoes well before adding them to the crock pot. 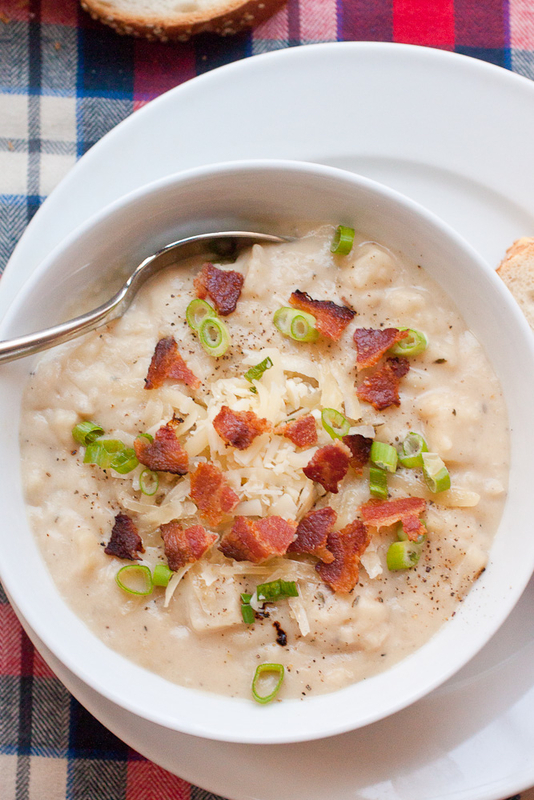 YES-I love potato soups and the fact that you make this in a slow cooker is all the better! 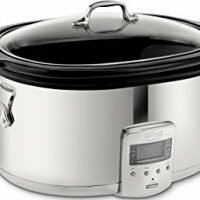 Agreed – I think I love the crock pot the most on the weekends when I really do need the time to get things done without having to worry about cooking dinner.